Paperturn automatically imports all recognizable links in your PDF, but you can also add and edit your own internal and external links. Make any content on the page clickable: text, images, phone numbers, or emails - and choose exactly the size and location of the clickable link area. Inserting external links to direct your clients to your website or another external site. Inserting internal links to link to a page inside your flipbook. By creating an internal link, you can easily help your reader jump to the section in your flipbook that is relevant to them. 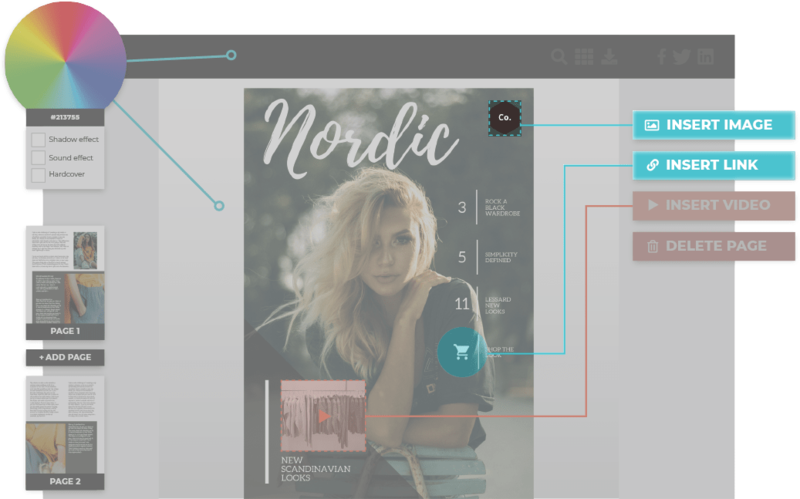 Adding internal links is also great for creating an interactive table of contents within your flipbook! extremely convenient when needing to quickly change a product picture, graph or image. You can choose the exact size and location of the image so it fits the flipbook’s original layout. Inserting GIFs can help you achieve a modern and eye-catching slideshow effect. You can easily showcase your product, service, venue etc. with an attractive GIF carousel! Visit our guide and learn how to insert interactive links and images/GIFs directly into your flipbook.